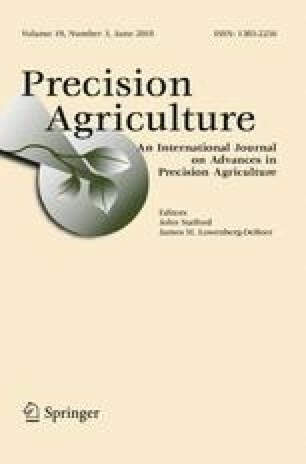 This paper investigated the possibility of discriminating tomato yellow leaf curl disease by a hyperspectral imaging technique. A hyperspecral imaging system collected hyperspectral images of both healthy and infected tomato leaves. The reflectance spectra, first derivative reflectance spectra and absolute reflectance difference spectra in the wavelength range of 500–1000 nm of both background and the leaf area were analyzed to select sensitive wavelengths and band ratios. 853 nm was selected to create a mask image for background segmentation, while 720 nm from the reflectance spectra, four peaks (560, 575, 712, and 729 nm) from the first derivative spectra and, four wavelengths with higher values (586, 720 nm) and lower values (690, 840 nm) in the absolute difference spectra were selected as a set of sensitive wavelengths. Four band ratio images (560/575, 712/729, 586/690, and 720/840 nm) were compared with four widely used vegetation indices (VIs). 24 texture features were extracted using grey level co-occurrence matrix (GLCM), respectively. The performance of each feature was evaluated by receiver operator characteristic (ROC) curve analysis. The best threshold values of each feature were calculated by Yonden’s index. Mean value of correlation (COR_MEAN) extracted from the band ratio image (720/840 nm) had the best performance, whose AUC value was 1.0. The discrimination result for a validation set based on its best threshold value was 100%. This research also demonstrated that multispectral images at 560, 575 and 720 nm have a potential for detecting tomato yellow leaf curl virus infection in field applications. The authors gratefully acknowledge Dr. Xueping Zhou for providing the tomato yellow citrus leaf virus. The Department of science and Technology of Sichuan province (2017JY0144) for financial support. Chappelle, E. W., Moon, S. K., & McMurtrey, J. E., III. The red edge shift: An explanation of its relationship to stress and the concentration of chlorophyll A. In Geoscience and remote sensing symposium, 1991. IGARSS ‘91. Remote sensing: Global monitoring for earth management, International, 3–6 Jun 1991 (Vol. 4, pp. 2287–2290). doi: 10.1109/IGARSS.1991.575500.